When I first saw the title of Dina’s book, having ‘met’ her on Twitter, I had a hunch that I was going to like her work – the clue’s in the name. 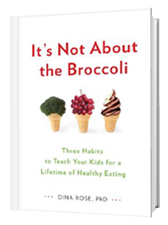 It isn’t about the broccoli, and any resource explaining that the way to address fussy eating is to look at the behaviours and relationships that surround it rather than focusing on what a child is consuming at any given sitting, sounds good to me. As soon as I opened this book, it was clear that Dina and I were from the same ‘tribe’. So what will you get from reading It’s not about the Broccoli? Firstly, a fascinating exploration of why parents make the food choices they do, the power of marketing and the kinds of parental attitudes that can contribute to picky eating. Secondly, an understanding that children need to learn healthy behaviours in relation to food – they need to learn the ‘habits’ that will help them grow up to make good decisions about what they eat. According to this book, these habits are 'proportion', 'variety' and 'moderation'. Dina explains why these are important and how to teach your child about them. She talks about the' Nutrition Mindset' (along with other unhelpful styles of approaching food and feeding that parents can typically fall into). This is a brilliant concept – it neatly summarises how concentrating on what your child is eating rather than on their relationship with food can (and usually does) lead to problems. Dina manages to convey the sense that picky eating is an issue that parents contribute to and yet she doesn't talk in terms of blame and her tone is informative and chatty rather than patronising. I was extremely interested to learn that children who are afraid of new foods are also more likely to be afraid of new life experiences. Dina recommends getting your child used to trying new things that have nothing to do with food, in the hope that this will make them less daunted by the unfamiliar. I loved Dina’s advice about consciously teaching children how to recognise when they are full. She suggests using dolls as well as making sure they have a conceptual understanding of hunger, fullness and over-eating. I thought Dina’s point about giving children the vocabulary to talk about food was excellent. How can they move away from ‘Yuk! Disgusting!’ if they don’t have the words…? I did part company with Dina a couple of times – I’m not sure about her classification of food into three groups, 'growing foods', 'fun foods' and 'treat foods'. I think it’s great for children to have an understanding that there are some foods we only eat occasionally but I worry that by overtly reinforcing the idea that the foods which fall into the ‘treat’ category are the ones which are worst for us, you could inadvertently make them seem all the more alluring. The danger of splitting food in to ‘good’ and ‘bad’ is something I have written about elsewhere. Dina’s use of the term ‘growing foods’ is more subtle and positive than simply giving the message that a certain food is plain hard work, but I wonder if children might hear it like that… Anyway, there are many ways up the mountain, and Dina and I are certainly climbing the same mountain. This is a well-researched, thought-provoking book – full of practical ways of addressing picky eating but equally interesting for anyone wanting to think about how we eat as a society and the factors that determine our food choices.